Design and construction administration of the 1,485 square foot chapel and 1,003 square foot curator’s office on the campus of the University of Florida in Gainesville, Florida. The works of Fay Jones inspired the design of the non-denominational church that sits on the edge of lake Alice in the center of campus. The chapel’s width is a narrow twenty-four feet and its height is almost forty feet at its peak. The chapel’s seating capacity is 90 people. The construction of the chapel utilized thin walled exposed steel tubes and tube trusses at six feet on center which allowed glass side walls for almost the entire length of the chapel giving it an open air feel. The roof was built with tongue and groove decking connected to the steel trusses below the standing seam roof. The design consisted of a 60,800 square foot two story enclosed church and 2,000 square foot entrance canopy. The building was constructed using load bearing concrete-tilt walls and masonry walls that are supported on a conventional shallow foundation system. The first floor is a concrete slab-on-grade. The second floor of the church is a concrete slab cast above a metal deck using composite steel beam construction. The roof system is a metal deck supported by structural steel and steel bar joist framing. The masonry walls and concrete-tilt walls are resisting the lateral forces. Performed the structural design and threshold inspection of the 826 spaces - five-level parking garage in Jacksonville’s downtown for the First Baptist Church. The scope not only included the parking garage but also a pedestrian bridge connecting this garage to the Church’s adjacent garage and an attached 100 foot high fully working lighthouse with an average diameter of 15 feet. The parking garage was sited on First Baptist’s property to give them the most parking spaces possible for the 54,000 square foot footprint, however, this placed the perimeter of the garage as close to the city’s property lines as possible requiring innovative foundation designs to miss the underground utility lines and the city’s easements. The garage’s superstructure was constructed with pre-cast concrete elements and was supported on conventional shallow foundations. The ground level was constructed of cast-in-place concrete up the mid-level of the ramp. The construction of the lighthouse varied drastically from the garage and was built with structural steel braced frame to support the structure. The exterior of the lighthouse was constructed with light gage steel vertical studs placed around the perimeter to provide its circular and tapered appearance. On the top of the lighthouse, a 14-foot high cross of painted structural steel tubing was erected. Design of the elevated concrete tilt-wall panels surrounding the perimeter of the sanctuary. The panels were supported at the 2nd and 3rd floors of the church and were located at the radial perimeter of the church. Provided structural engineering design and documents for the addition of an entry tower to the church’s existing sanctuary in Williston, Florida. The design complemented the existing church’s architecture while minimizing construction costs. Renovation of the Ponte Vedra church’s existing 8,000 square foot sanctuary to increase its size to 9,300 square feet and to increase the church’s seating capacity. Included in this renovation was a new enclosed narthex at the entrance to the sanctuary. The additional roof was constructed with conventional timber framing that was supported with either bent steel frames in the narthex or concrete frames in the sanctuary to match the existing construction. The exterior walls of the sanctuary were constructed with masonry while the narthex was enclosed with window walls. 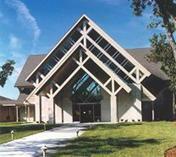 Design and threshold inspection for the Baptist Church in Orange Park, Florida. Design and construction administration services of the 650 seat - 15,000 square foot sanctuary, 3,500 square foot administration building, and 2,500 square foot covered gathering area along with covered entries and walkways. The exterior closure of the building is constructed of concrete masonry while the roof construction varies due to architectural considerations from steel bar joists and pre-fabricated wooden trusses, to architecturally exposed glued-laminated beams. Design of the support system for the forty-foot moveable partition located within the existing church’s auditorium. A survey of the existing church’s structural members was performed and a support system for the partition was designed that allowed the contractor to install the system without any structural modifications to the existing roof members and without removing any of the church’s existing walls, windows, or doors to facilitate the church’s activities during the construction. Design of the renovation and extension of the church’s 55 degree pitch gable framing at three sides to increase the church’s seating capacity in the sanctuary. The original church’s size was increased from 4,700 square feet to 7,200 square feet increasing the seating to approximately 450 people. The remainder of the church was also analyzed and upgraded to resist the building code’s current hurricane wind forces. The exterior walls of the building are constructed with masonry and support the main steel beams outlining the pitch of the roof. The beams support a 3” tongue and groove roof deck. Design and construction administration services of the 11,500 square foot catholic church and 2,700 square foot exterior covered walkway. The church’s capacity of 600 people is confined to the 1st floor. The 2,200 square foot 2nd floor supports the mechanical equipment and storage areas. The church is constructed with concrete masonry exterior and exposed architectural glued-laminated arch beams supporting a 3” tongue and groove roof decking. The 2nd floor is constructed with wood framing and a 4” concrete topping for noise isolation. Threshold inspection of a two-story 36,500 square foot catholic church with a seating capacity for 2,167 people. Shallow foundations support the church’s structural steel frame. Steel braced frames hidden within the exterior light gage walls surrounding the perimeter of the church provide the lateral resistance of the church. Not only is the size of this catholic church impressive but also the construction of the concrete dome in the center of the sanctuary that starts at the roof elevation of forty-three feet above the floor and extends up to seventy-three feet above the floor. The dome was constructed by shotcreting the concrete and is supported by steel beams at its perimeter that is within the middle of the roof system. Design of a 6,600 square foot sanctuary attached to a 4,200 square foot classroom building with 2,200 square feet of exterior covered walkways in Ponte Vedra, Florida. The sanctuary’s roof was constructed with 3” tongue and groove decking being supported by steel trusses clear spanning the sanctuary. Masonry walls were used as the exterior enclosure with integral masonry piers supporting the trusses. The classroom building was also constructed with masonry walls the supported the pre-engineered wood truss roof. Performed the structural design of the 246,000 square foot eleven-story condominium project. The first phase includes the eleven-story building with the yacht club and pool deck, the 90 boat slip marina, the site retaining walls, and the guardhouse. This building features nine levels of living units above two levels of parking. Two future buildings are intended for this site, Building “B” and Building “C”. The pile foundations for Buildings “B” and “C” are included as part of the first phase of construction in order to avoid creating site vibrations which could damage the existing structures at the site. All buildings will have nine levels of residential living space and two levels of parking. Column locations between the residential parking levels and living spaces do not align and are carried by transfer beams at both levels of the garage. The total project budget is 88 million dollars.